T.H. Williams Books | Young Adult Books | Books For Teens Fad? I Think not. 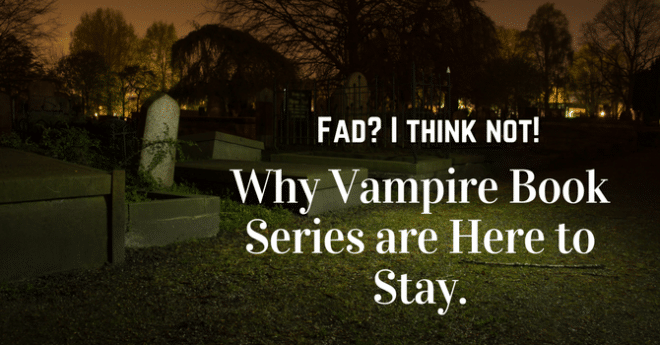 Why Vampire Book Series are Here to Stay. Oh no, here it comes, another vampire book series. Can I really read another one? You bet I can. I can’t get enough of them. Some might think I’m crazy but I could read another twenty books about Bella and Edward. Disappear for days on end as I explore the newest dilemma in the lives of Damon and Stefan Salvatore. Unlike other books, I don’t even particularly care if they’re well written, as long as the story takes me away from the real world for a few hours at a time. Maybe I’ll read it in a graveyard in the hopes that the characters in the books are real and a hungry vampire might see fit to turn me. And that’s the point right there, why the vampire book series phenomenon will never die: we all secretly hope that they are real. However brutal and blood thirsty they are, there’s also something deliciously seductive about them. They make the pages of books turn like no other. I eat them up and I know I’m not alone. The strength, the abilities, they all outweigh the true nature of the beast, making it almost impossible to refuse the allure of the bloodiest of offerings. But how many of us would take up the offer if it truly came our way? I’ve debated this with myself on more than one occasion. The pitfalls, the benefits, the ugly with the perfection, and in the end I had only one question: would I be a good vampire, or a blood thirsty monster. It’s hard to say. I think I would have a hard time eating innocent animals, so perhaps the latter. So I ask you this, what sort of vampire would you be? Would you be worthy of a vampire book series? Or would you simply hide in the shadows, waiting for your next meal?